3M(TM) Adhesion Promoter 06396 is a liquid primer used for enhancing adhesion of 3M(TM) Acrylic Foam Tapes for interior and exterior trim applications. 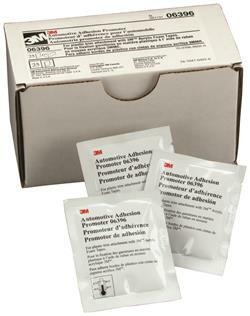 3M(TM) Adhesion Promoter 06396 is specifically formulated to be used with 3M(TM) Acrylic Foam Tape for automotive applications. 06396 is often used with low-surface energy plastics such as TPO, PPO, PP, PC, PC + ABS, etc.). Since formulations and surface energies can vary for these types of materials, each application should be verified through testing. 06396 is supplied in an easy-to-use sponge applicator packet. The liquid contents of the packet should be completely used as soon as possible after opening. Apply promoter only to the areas that will be fully covered with tape. The primer should be dry before applying tape. For best results, apply tape immediately after primer application or no more than one hour after primer application. Be sure the primed surfaces remains free from contaminants prior to tape application. Jaco Aerospace and Industrial is your one stop resource for 3M(TM) Adhesion Promoter 06396 is a liquid primer used for enhancing adhesion of 3M(TM) Acrylic Foam Tapes for interior and exterior trim applications. and all of your 3M Products, Tapes, aerospace and industrial needs.